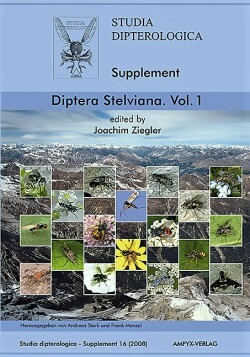 Volume 1 in the series "Diptera Stelviana" provides the first results of the Diptera (two-winged flies and midges) that were collectedin the Parco nazionale dello Stelvio (Stilfserjoch National Park, Italian Alps). The book begins with an introductory text followed by a description of the study area, and there is also an explanation of the system of ecological altitudinal zones that is adopted. In addition, current changes in the alpine landscape are documented and discussed. The methods used to survey the diversity of Diptera are then described. Net collecting, yellow-tray traps, window traps, and Malaise traps were used. The five Malaise traps were set up in 2005 along a transect from the submontane to the alpine zones (940 to 2,315 m above sea level) in the South Tyrol part of the National Park.